You may have come across the term ‘natural voice’. You may also have realised by now that I am a member of The Natural Voice Network. But what exactly is the ‘natural voice’ and how do choirs run on ‘natural voice’ principles differ from other choirs? You’re in luck! Caroline Bithell has just written an amazing book that answers all your questions. Let’s look at what’s in it. I’ve written before about the Natural Voice approach to singing and you can also find out more about the general philosophy on the Natural Voice website. have a strong focus on community (rather than an emphasis on performing for others). This is a very rough categorisation within which there is a wide range of natural voice choirs ranging from singing for fun choirs which don’t perform, to choirs which record CDs and perform regularly to a very high standard. 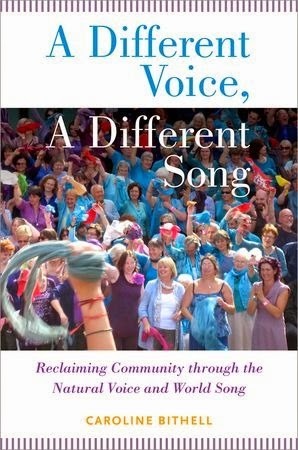 Her book is called A Different Voice, A Different Song – Reclaiming Community Through the Natural Voice and World Song and is published by Oxford University Press in hardback, paperback and as an eBook. It is a masterful account of all the various strands which have come together to create the natural voice movement and should answer all your questions. But if you still have some after reading the book, drop me a line and I’ll try to answer them!